Beyond Good and Evil is a popular action adventure game that was first released in 2003 for the Xbox, PlayStation 2 and Windows. 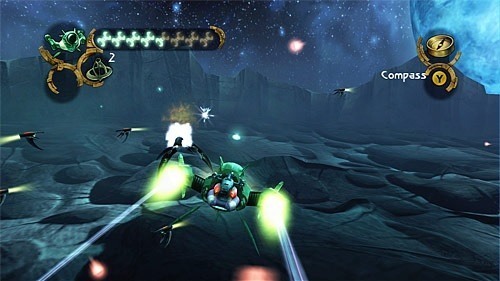 Its widespread popularity led to a HD remake for the PlayStation 3 and Xbox 360 in 2011 which is available on their respective online stores. The game is set in the future on the planet Hillys and offers an interesting mixture of modern day technology, fantasy and sci-fi all rolled into one. Hillys has recently come under attack from a strange race of aliens known as the DomZ which spend their time sucking out life force or enslaving humans. The military rule currently in place on Hillys has been unable to stop the attacks which leads to the creation of a resistance movement to undermine the military dictatorship and help the people. In Beyond Good and Evil players will step into the shoes of Jade who is recruited into the resistance for her talent as a photojournalist. For many of the missions players will also be joined by Jade’s uncle, a boar creature named Pey’j. The game centres heavily on Jade’s photography skills with missions requiring evidence to be collected. Jade can even take photos of animal species that she encounters and trade them in for the game currency. Gameplay grabs small elements from several genres and mixes them together to deliver a highly enjoyable experience. 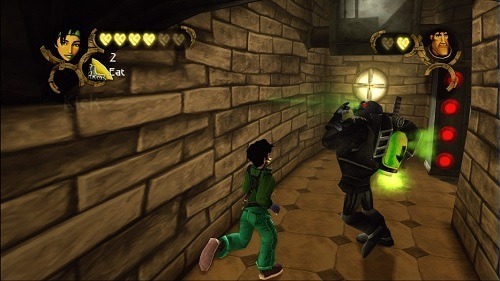 The core gameplay will have Jade battling multiple enemies, using stealth to her advantage, exploring a large game world and completing various puzzles. Platforming rounds out the Beyond Good and Evil experience with players able to jump, climb, push and interact with various objects around the world. Beyond Good and Evil is packed full of content and is truly an impressive adventure that fans the genre shouldn’t shy away from. One of the most popular action adventure games around. Huge world to explore with no shortage of side activities to engage in. Fast paced combat with a great flow. Great use of stealth levels and simple puzzles. Originally released for PlayStation and Xbox now with HD remakes for Xbox 360 and PS3.